This article is the third in a series teaching the basics of photography. We started by learning about the properties of light and how an image is created, and we also learned how a lens bends light to focus individual rays into a single bright image. With this lesson we are going to finish learning the scientific theory of lenses and how to use lenses for magnification in addition to brightness. In the last lesson we performed an experiment to focus the light of a candle through a lens. We also learned that to determine the focal length of the system, we move the focusing screen forward and backward until the image of the flame is in focus. Let’s consider that candle/lens system for a moment. 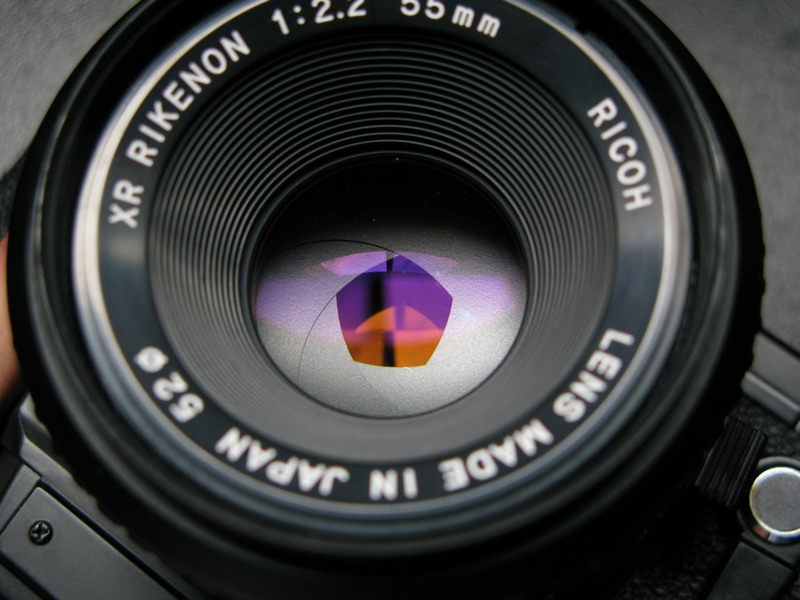 What do you think would happen if we replaced the lens with one that is twice the diameter with the same focal length? Would the image be twice as bright? Image twice as large? If you guessed the larger lens would make the image brighter, you would be correct. The larger lens has more area to collect light, which actually equates to an image more then twice the brightness at a ratio equal to πr² where r equals the radius of the lens. The image would, however, be no larger since the focal length of the lens is that same. Diagram of decreasing apertures, that is, increasing f-numbers, in one-stop increments; each aperture has half the light gathering area of the previous one. In photography, you often hear lenses described as a focal length and their f-ratio. The f-ratio describes the relationship between the lens diameter and the focal length and is calculated by dividing the focal length by the diameter of the lens. For example, if a lens were to have a focal length of 50mm and a diameter of 10mm, then the f-ratio would be 50mm/10mm=5 or otherwise referred to as f5. If you were to double the diameter of the lens, 50mm/20mm = 2.5, the f-ratio would be f2.5. As you have probably already concluded, lower or “shorter” f-ratio means more light being focused into the image, and thus a brighter image. The f-ratio and focal length of the lens will almost always be printed on the ring surrounding the glass. If you ever hear someone refer to their lens as “fast” or “slow” they are referring to the f-ratio of the camera. A “fast” lens is one that brings in the most light the quickest, thus having a short f-ratio, i.e., f1.2 or f2.5. A “slow” lens will take longer to collect the same amount of light, so generally the f-stop will be larger, i.e., f8 or f12. When we discussed the camera obscura in the beginning of this series, we noted that while a larger aperture to let light in would increase its brightness, it would also decrease the clarity of the image. After adding a lens into a camera obscura experiment, you can understand the relationship between these two variables a bit better. A faster lens (shorter f-ratio) will have a narrower depth of field (smaller plane of focus). Modern DSLR cameras allow a photographer to vary the aperture of their lens, thus changing the f-ratio or speed of their camera. Lens detail showing f-ratio, focal length, lens diameter and a partially closed aperture. While a larger aperture diameter might increase the brightness and sharpen the focus, increasing the lens magnification will increase the focal length and thus enlarge an image. The amount of focal length that you desire will define how much magnification your lens needs. Think about magnification in terms of how much your light bends. The more curve in your lens, the more your light will bend toward a center focus. Creating more curve in a lens means adding thickness to the lens, thus adding more material to slow the light down as it passes through the lens. So as you can see, magnification affects not only the focal length but also the brightness of an image. We’ve been talking about magnification in terms of increasing the size of an image, where in almost all photography the image you create is significantly smaller then the original object. One type of photography where you are looking to increase the size of the image created is called macro photography. Special lenses are designed exactly for this specialized purpose, built with a long focal length and a very close object to photograph. Macro lenses are describe by their magnification factor, meaning that a 1:1 lens will produce a true to life image on the detector. A 19.05mm penny will produce a 19.05mm image on the detector, taking up over half of a full 35mm detector or nearly 80% of a cropped frame sensor (what you will find in most lower end cameras). A magnification factor of 1:1 is generally the minimum to be considered a macro lens, with other lenses reaching to the 1:10 range (magnifying an object 1mm in diameter into an image 10mm in diameter). 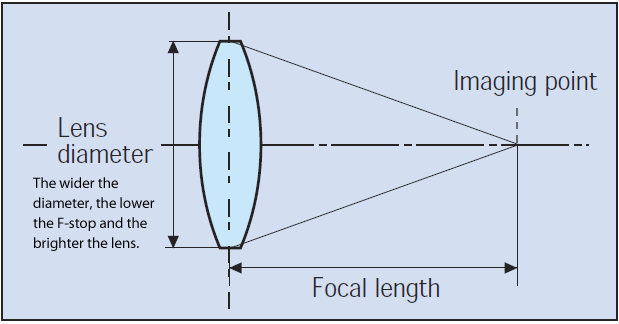 Optical diagram showing the effect of focal length and sensor size on field of view. The final piece of the optics puzzle is something called field of view (FOV), in other words how much of the world the detector can see. The FOV of a lens depends on its focal length and the size of the detection surface or camera detector. Let’s consider taking a picture of the same object while only varying the focal length of the system. As the focal length increases the FOV narrows, increasing the size of the image on the detector. FOV is fairly simple to visualize by simply following the ray trace in the optical system. 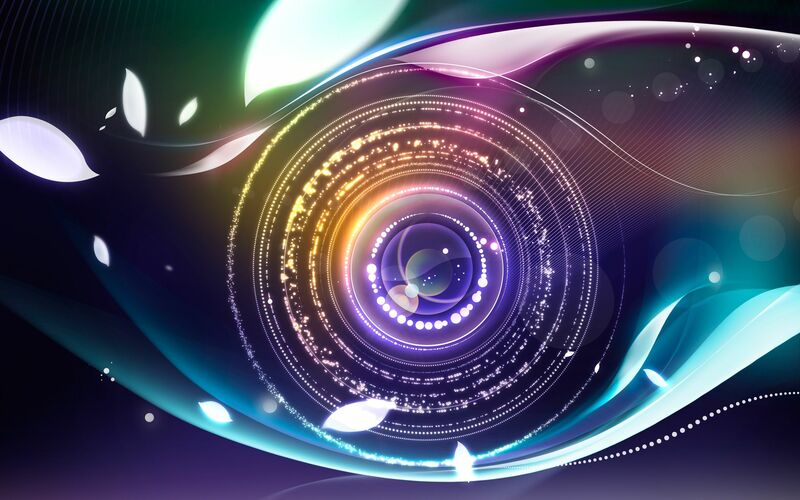 One specialized type of lens is a “fish-eye” lens. These lenses are distinct because of their extremely short focal lengths, between 10mm and 20mm, and their bulging glass that looks like a fish-eye. These lenses have a 180-degree or larger field of view, making them particularly good for capturing the entire night sky in a single image. Five images using 24-, 28-, 35-, 50-, and 72mm-equivalent step zoom function, to illustrate angles of view. While the lens focal length will effect field of view, another factor in field of view is detector size. In a DSLR you will generally have either a “cropped” sensor or a full 35mm frame sensor. 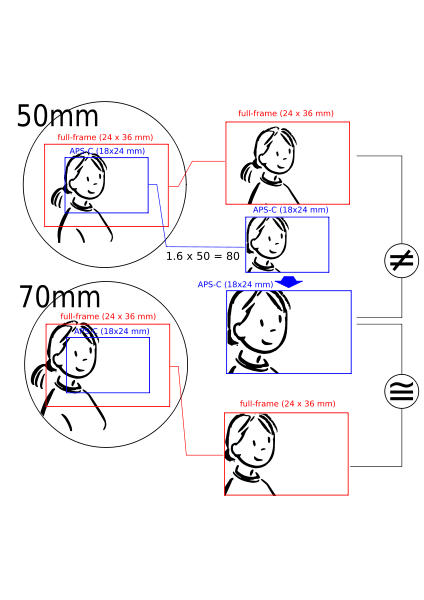 A cropped sensor is defined by its crop factor or focal length multiplier (FLM); the ratio of a 35mm frame’s diagonal to (43.3mm) to the length of the diagonal on the “cropped” sensor. In Canon DSLRs the crop factor is 1.6, while on most other brands of cropped sensors the factor is 1.5. This ratio is multiplied to the focal length to determine the focal length of a lens that would yield the same field of view. For example, a 50mm lens on a Canon cropped sensor would produce similar images to a full framed camera with an 80mm focal length lens attached. The cropped images will always “look” more zoomed in, however this magnification is simply caused by caused by the aforementioned crop factor. A zoom lens combines lens shape, diameter, and focal length and their respective distances from one another to vary aperture and magnification within a system. While some zoom lenses have close to 30 different optical elements that interact to create an image most zoom lenses have the same basic design, they consist of a number of individual lenses that may be either fixed, or slide axially along the body of the lens. One of the most common zoom lens designs divides the optical assembly into two sections, a fixed focal length focusing lens and an afocal zoom system consisting of a series of fixed and movable lenses. The afocal system’s purpose isn’t to create a focused image but to simply change the size of the image hitting the detector. The result is a focused image that changes size on the detector. A simple zoom lens system. The three lenses of the afocal system are L1, L2, L3 (from left). L1 and L2 can move to the left and right, changing the overall focal length of the system. In my next installment of Photography Snapshot, we will move further away from the theory of photography and explore the exposure triangle, starting with aperture. We will begin to learn how to manually take control of the images you form and we will start short homework assignments to get you out shooting with your camera.